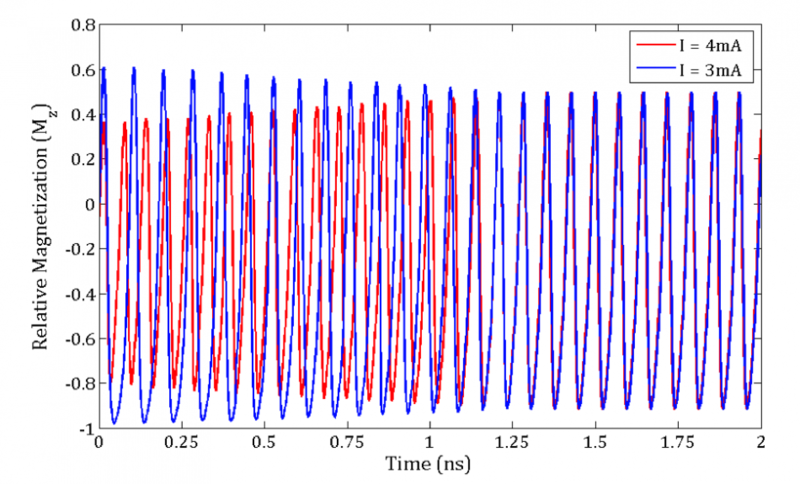 One of the more unusual sessions at DAC 2014 focuses on what you can do with nanosized devices when they stop functioning reliably as switches – use them as oscillators and wire them together so that information is processed and delivered in the form of changes in frequency and phase. To some extent, the technique has a lot in common with the way the brain works. Neurons don’t send each other bits of information. They send trains of pulses. Although scientists are still developing models of why this works, it has become clear that the information is not in the pulses themselves but in the spaces between them. Much of our biology revolves around the oscillations of (mostly) negative-feedback loops – the most obvious being the circadian clock that regulates sleep patterns. Rough analogs of this behavior could be used to drive new algorithms for pattern recognition, some researchers believe. Earlier this year, researchers from Suman Datta’s group at Pennsylvania State University published the results of their work on synchronised charge oscillations in Nature, using the ability of vanadium dioxide to shift between metal and insulator states. The coupling seems to operate reliably over longer distances than electron spin – another property that could follow on from today’s predominantly charge-based circuits. Because the coupling looks as though it could operate over large arrays, the researchers believe it could lead to novel computing schemes. Datta, who is a former Intel engineer who developed high-speed III-V devices as well as high-k metal-gate and trigate transistors while there, will describe how the coupled relaxation oscillators could perform neuro-inspired computing on Wednesday morning (4 June). 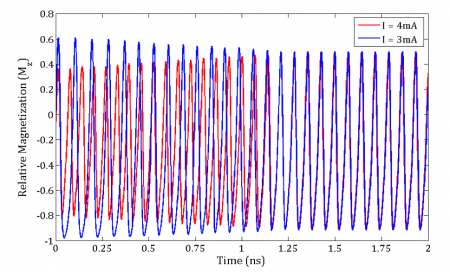 Spin itself provides a potential source of oscillator coupling. Working with Professor Mircea Stan, Mehdi Kabir from the University of Virginia will describe work on using spin-torque effects, derived from those used in the latest generation of magnetic memory (MRAM). The spin valves in these devices can be driven into oscillation by changes in current. One way to use these oscillators is not within large arrays but within smaller gates that offer novel alternatives to CMOS logic. A group of spin-torque oscillators (STOs) can be used to form a majority gate, using three inputs and one oscillator for the output. The oscillators use common ferromagnetic layer that allows spin waves to propagate along the device, letting the oscillators couple. The frequency of the output oscillator is determined by the majority of the inputs, providing a logic output. Stan has described in the past ways in which the majority-coupling behavior, together with a simple bandpass filter to select only frequencies that correspond to good matches, could be used to built associative memories, useful for pattern recognition. Kabir will describe how the STOs can be combined with CMOS. The session kicks off with Intel’s George Bourianoff, who has spent a number of years investigating a wide array of possible post-CMOS devices, from spin-based devices to quantum switches based on resonant quasiparticles in graphene sandwiches. At DAC he will focus on phase-coherent information processing.